1.Preheat oven to 350 degrees F (175 degrees C). 2.Line muffin tins with 12 paper baking cups. Place a vanilla wafer in each one. 3.In a medium mixing bowl beat cream cheese until fluffy. Add eggs, lemon juice, and sugar. Beat until smooth and thoroughly combined. 4.Fill each baking cup 2/3 full with cream cheese mixture. 5.Bake in preheated oven for 15 to 17 minutes. Cool on a rack. Top with fruit pie filling. 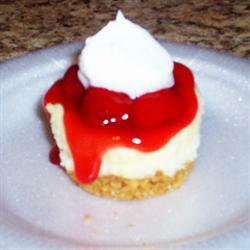 Pipe whipped cream or sweetened cream cheese into a rosette on top of each cheesecake just prior to serving, if desired. Brown meat in hot oil. Add water, Worcestershire sauce, garlic, bay leaves, onion, salt, sugar, pepper, paprika, and allspice. Cover and simmer 1 1/2 hours. Remove bay leaves and garlic clove. Cover and cook 30 to 40 minutes longer. To thicken gravy, remove 2 cups hot liquid. Using a separate bowl, combine 1/4 cup water and cornstarch until smooth. Mix with a little hot liquid and return mixture to pot. Stir and cook until bubbly.